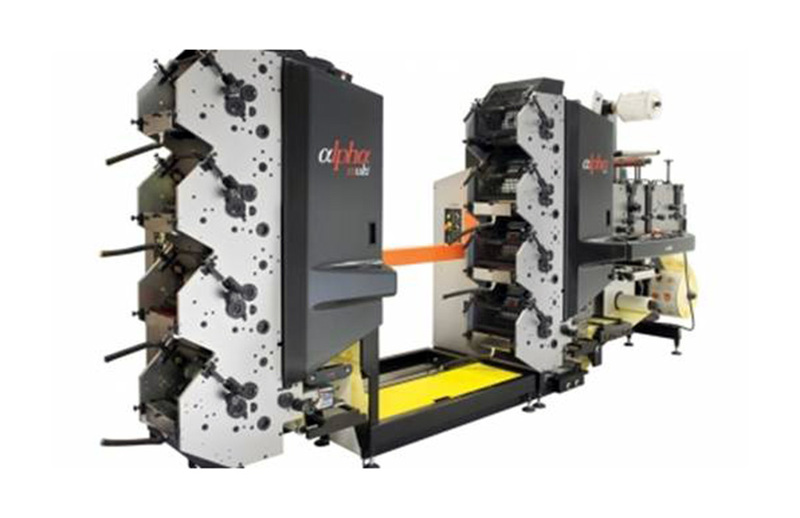 The first of a new generation of dual stack presses from Edale, the Alpha Multi, has been acquired by Kingfisher Labels. Edale has installed its first Alpha Multi press at Kingfisher Labels, an established label converter based in Yate, North Bristol, UK. The Alpha Multi is effectively two Alphas – a 4-color and a 5-color – ganged together with a switchable web path. Each stack has its own infeed and web guides and the whole press takes up no more than 5sq m of floor space. This arrangement means one stack can be in production while the second is made ready, or the same web can be run through both stacks, allowing up to nine colours to be printed in a single pass. Customers with an Alpha can upgrade to the Multi in the field. A significant input from Kingfisher’s side was the turn bar on the press, which allows the company to print both sides of the web in full colour and with the addition of varnish and cold foil where necessary. Other aspects of the Multi are identical to the Alpha. IR and UV curing are available, as well as cold foiling. A quick release plate roll mechanism allows accurate registration to be achieved quickly, and a three nip tension control system aids registration stability. Quick release lightweight ceramic anilox and doctor blades help speed up make-ready. All tooling is fully interchangeable with Kingfisher’s existing Edale machines. The fast changeover of the Multi press is particularly important with the growth of shorter runs and of multi-sorts within the same order. One recent job involved 30 sorts, which is not untypical. The future looks bright for Kingfisher – an opinion shared by the company’s UK sales director, Andy Watts, who has a wide range of experience in the labels industry with larger print companies, and was happy to commit to a smaller, more agile business like Kingfisher. ‘We can make a significant impact with our ability to respond faster and are more flexibly to customers’ changing demands,’ said Watts. Looking at the wider business sector today, Martin Jackson said ‘One of the biggest problems faced by Kingfisher Labels over the last two years has been the vicious downward spiral of selling prices within the marketplace when laminators and paper manufacturers are increasing their selling prices 2-3 times per year.